0. A zipped file is available that can be used to set up an executable VB6 program. key. A practice program called "River" is stored in the zipped file as well. You can load it to see how it looks. can be used to create a hard copy plot. 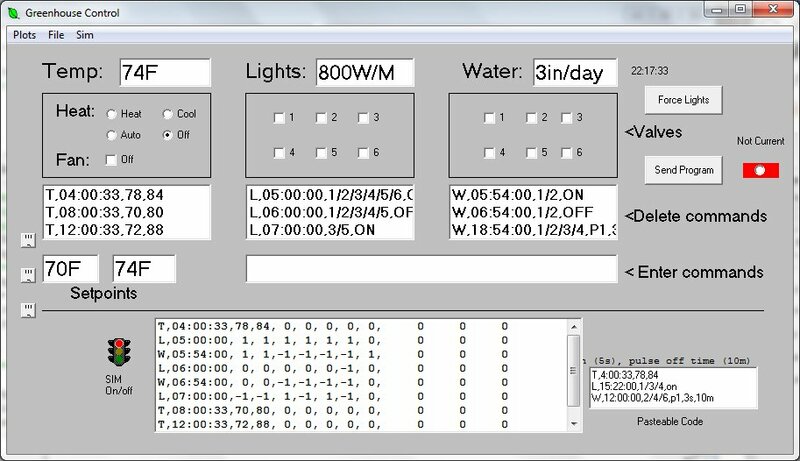 There are six each light relays, water solenoids, and misting timers. sequence. This is used so the mist sprayers don't all turn on and off at similar times. 3. 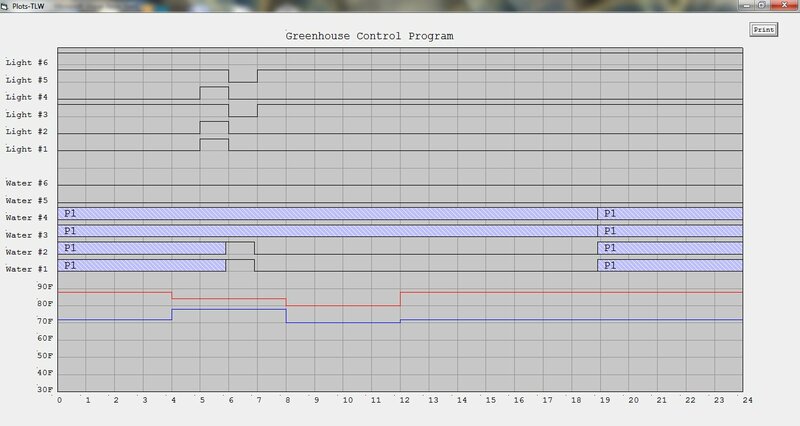 If you hit the sim button, a simulation of the greenhouse controller is run in a separate window. in seconds and all command lists are simple numbers, no letters. This is in anticipation of actual success, ha!! FCIH. flash memory and our local REMC is not that outage friendly. no error checking, and variable names only I can remember after a few hours on a lawn tractor, etc. *2. Won't handle single command programs. *3. Won't handle situation where no control program exists. 4. Does not tolerate long time delays, pending command requires exact second by second match, silly me. *5. One serious fatal is suspected to exist in simulation mode found out while writing plot routine. checkboxes on the front form don't mean anything. 8. Loading and unloading of forms not properly coordinated, may crash after multiple loads. 10. Save and load are simplistic, no suffix support. 11. You really have to work to get stuff happening in real time and no way to FF (fast forward) the sim. Main Screen after a sim or plot run.